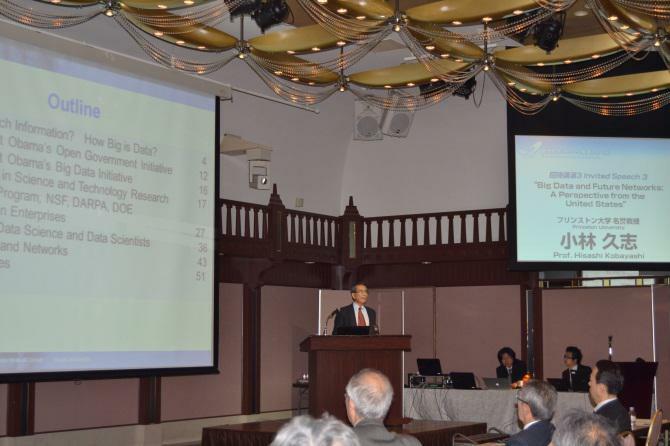 At the 7th New Generation Network Promotion Forum (第７回新世代ネットワーク推進フォーラム), I gave an invited talk entitled “Big Data and Future Networks: A Perspective from the United States” （「ビッグ･データと将来のネットワーク:米国からの展望」）. The forum was held on January 16 (Wed), 2013 at Hotel Floracion Aoyama, Tokyo (ホテル･フラシオン青山), and was attended by 120 people including representatives of the　Government, IT and networks industry, and academia. How Much Information? How Big is Data? 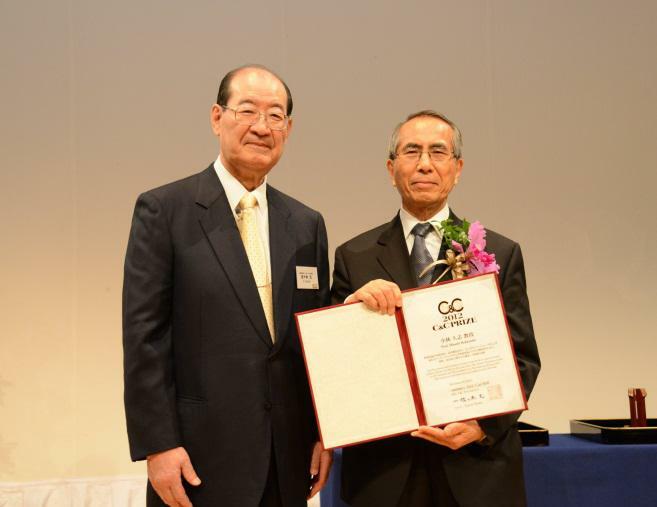 I was selected to receive the 2012 C&C Group B Prize (C&C賞グループB), and the award ceremony was held at ANA Intercontinental Hotel in Tokyo (ANA インターコンテイネンタル・ホテル東京) on November 28, 2012. (http://www.candc.or.jp/en/2012/ceremony.html). The 2012 C&C Group A Prize was awarded to Prof. Osamu Yamada of Waseda University (早稲田大学 客員教授の山田 宰氏), Dr. Toru Kuroda and Mr. Masayuki Takada of NHK Research Lab (NHK放送技術研究所の黒田 徹氏と高田 政幸氏) for their “outstanding leadership in the research and development of the ISDB-T digital terrestrial television broadcasting system “（「地上デジタル放送伝送方式IＳＤＢ－Ｔの研究開発に関わる主導的貢献」） (http://www.candc.or.jp/en/2012/group_a.html). For the slides (in Japanese) I used in my acceptance speech at the NEC C&C Prize ceremony, please click here. 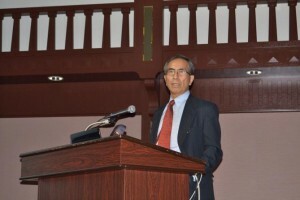 On August 29, 2012 my brother Shoshichi Kobayashi, Emeritus Professor of Mathematics at the University of California at Berkeley, died peacefully in his sleep. The memorial service was held on September 8, 2012 at Sunset View, El Cerrito, California, presided by Reverend Philip Brochard and Reverend Kristin Krantz. The service was attended by a number of Shoshichi’s colleagues, former students, family friends as well as his wife Yukiko Grace Kobayashi, his daughters, Sumire and Mei, Sumire’s husband, Philip Chou and their children, Andrew and Brendan, my wife Masae Kobayashi and myself. The readers were Andrew Chou, grandson and Yukiko Kobayashi, wife. The musicians were Ms. Miwako Tomizawa, violin, and Ms. Kuniko Weltin-Wu, piano. Here is a table of contents that includes the four remembrance speeches given at the service, and other materials concerning Shoshichi. Clicking any item will let you jump to that section. Reverend Brochard and Reverend Krantz, Ladies and Gentlemen. 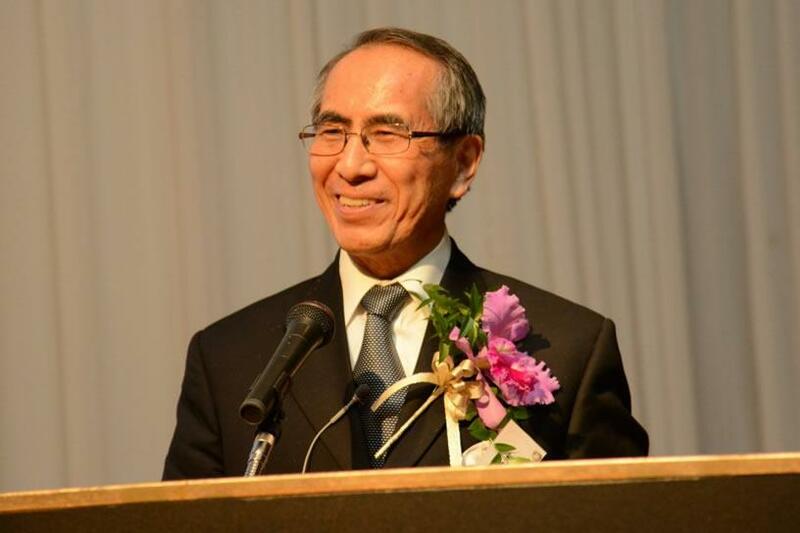 On behalf of the Kobayashi family, I would like to express our sincere thanks for kindly attending the funeral service of my brother, Shoshichi Kobayashi. Shoshichi was born on January 4th, 1932 as the first child of our parents, Kyuzo and Yoshie Kobayashi in Kofu City, Yamanashi Prefecture. Soon after his birth the family moved to Tokyo to start a business because they found such an opportunity was limited in Kofu at that time, when Japan was still in the midst of the Great Depression. The second son, Toshinori, the third son, Hisashi, that is me, and the fourth son, Hisao, were born three years apart. I am not sure whether our parents planned to produce children every three years, but this regular periodic sequence was interrupted during the war, so their fifth son, Kazuo, was born six years after Hisao. Unfortunately, Hisao died when he was only two years old, and Kazuo died soon after graduating from college. My second brother, Toshinori in Japan, is regrettably unable to join us here today because of his poor health. Since Shoshichi and I were six years apart, I don’t recall that we played together as children. He has been always my mentor and role model, and I am really fortunate to have had such a great brother. He was extraordinarily generous with his time in encouraging Toshinori and me to excel academically. As B-29 fighter bombers began to threaten Tokyo in 1944, we frequently had to run into a “Bokugo,” or an underground shelter. Shoshichi was in his sixth grade at Elementary School, and always carried mathematics books and candles with him. In the spring of 1945, our whole family decided to evacuate from Tokyo, and moved to Minami-Saku, Nagano Prefecture. Shoshichi attended Nozawa “Chugakko” (or Middle School) there. In the Japanese education system at that time, entering one of the eight so-called “Number Higher Schools” was most competitive. Advancing from one of these Number Schools to one of the Imperial Universities was less difficult. No. 1 Higher School (called “Daiichi Koto Gakko” or “Ichiko” for short) in Tokyo was the most difficult Higher School to get into. The middle school at that time required five years of schooling, but students were allowed to take an entrance exam in their fourth year. But only a handful of brilliant students could pass the competitive exam. Shoshichi was successfully admitted to Ichiko in his fourth year at Nozawa Middle School. This was an unprecedented achievement by any student at the Nozawa Middle School, so Shoshichi became a legendary figure of the School. At that time I was a fourth grader at Elementary School. Our family was congratulated by everyone in the village. In the fall of 1948, six months after Shoshichi entered Ichiko, our family finally moved back to Tokyo. When he came home from his dormitory on weekends, he often took me to a “Furuhonya” (used book store) where he found appropriate math books for me to study. I was ten years old, a fourth grader. Shoshichi graduated from Tokyo University at age 21. During his senior year, he won a scholarship of the French Government that granted him graduate studies in France. So in the summer of 1953, he left Yokohama by ship for France. But his role as my mentor did not stop there. Before he left for France, he bought for me a Japanese translation of “A Survey of Modern Algebra” written by Harvard professors, Birkhoff and MacLane, and instructed me that I should study one chapter per week and send him by airmail my solutions of exercise problems. He corrected errors in my solutions and sent them back by airmail. So he continued to be my teacher even after he left Japan. He must have been very busy with his own study in France, but he was very generous about spending his time to educate me. After a year’s study at mathematical institutes in Strasbourg and Paris, he moved to the U.S. in 1954, admitted to the Ph.D. program of the University of Washington in Seattle, where he received his Ph.D. in less than two years at age 24. During this period he told me that mastering foreign languages was important and that I should start studying German. So I was enrolled in Takada Gaigo, a foreign language institute, near my high school. I think Shoshichi’s character changed significantly after his marriage with Yukiko-san. In almost all photos taken after the marriage, he is always smiling or laughing. I don’t recall seeing his smile often when he was in Japan. He was always serious looking. After he got married with Yukiko-san, he never said anything critical to me such as “Hisashi, you are wasting your time.” I am thankful to Yukiko-san for transforming Shoshichi to a well-rounded and tolerant character. I think that he has led a very happy and gratifying life, surrounded by his cheerful wife, two loving daughters, Sumire and Mei, a very thoughtful son-in-law, Phil Chou, and two promising grandsons, Andrew and Brendan. He would have written a few more books, were he able to live for several more years, as we expected, but ending one’s life during sleep, as he did, is the most peaceful way to depart from this world. In this sense I am happy for him. 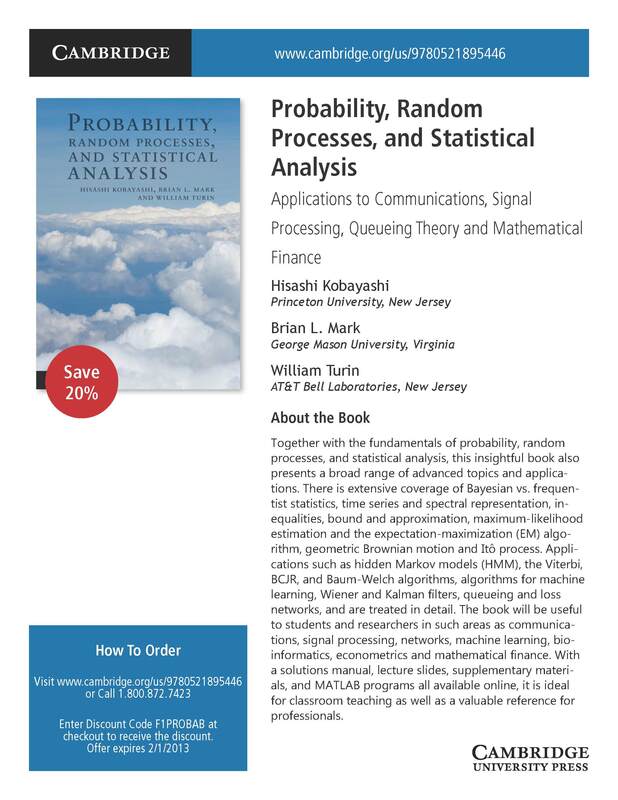 We all miss him dearly, but Kobayashi’s theorem, Kobayashi’s metric, his fifteen books and numerous research papers will be here to stay forever. He has had a great life, and we are proud of being part of his life, and will cherish our fond memories of him for many years to come. My first memory of my father was our annual fall event – getting dressed up with my sister to go to the UC campus to be photographed for my parents’ upcoming Christmas card. Weeks before the event, my mother spent hours sewing us matching dresses then finding lace bobby socks and patent leather shoes. Sumire, being the A+ student that she was, always cooperated. Me? Well, … My parents found it a challenge to get me dressed and an even greater challenge to get me to sit still for 2 to 3 rolls of film (that is, 2 to 3 dozen photos). Ancient cameras of yesteryear consumed 3 square inches of film per photo so only a dozen could fit on each tall roll. My second memory of my father is on my first day of nursery school up in the Berkeley Hills. As he dropped me off, I begged him not to leave. He was scheduled to rush off to the University to work, but he parked the car and stayed an hour or so until I met and started playing with other children. A few days later he bought me a beautiful square lunch box with a matching thermos bottle and cup. It was white and adorned with pink flowers in a lace pattern. I could now walk in every morning as a fashionable young lady! Around elementary school, we started having dinner guests on a regular basis. To make sure I would learn table manners, I had to sit next to my father for breakfast, lunch and dinner. “Sit still. And don’t let you pigtails dangle onto my dinner plate”, he would say whenever I leaned over to whisper a secret to Sumire. Sitting next to my father ended up becoming an educational experience in a completely unrelated matter – mathematics. I am not sure how or when the practice started, but he taught my sister and me mathematics at the breakfast table every summer morning. When we became too uncooperative, he instituted a policy. We would receive 5 cents per page each time we completed a chapter and finished all of the exercises at the end. When we got a little older and more rebellious, he revised his policy to a whopping 10 cents per page, but we were required to deposit 50% of our earnings in the bank to save up for college. We were quite naïve at the time, and were quite pleased with ourselves for having negotiated what we thought was a fantastic deal that doubled our earnings. Before we went off to college, we were surprised when our father told us that we were now adults and responsible for ourselves. The temptation to keep clinging on as a parent would be too great if we stayed in Berkeley. “Just as children must outgrow childhood, parents must outgrow parenthood”, he said. My last memory from my childhood is at Oakland Airport. My father is standing with my mother by his side. Both are desperately trying to look happy, confident and reassuring. They are smiling and waving good-bye as I board a plane to Newark to go off to study at Princeton. 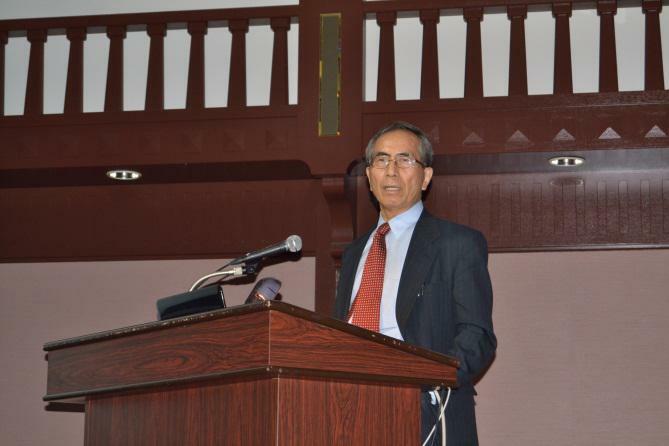 I have known Shoshichi Kobayashi since the 1960’s, when I started here as a graduate student. I have been a faculty member since 1969, and it is partly thanks to Sho that I am still here. He was chair when I had an offer from Caltech in the late 1970’s. He very effectively convinced me to forsake sunny Southern California and return to Berkeley, on attractive terms which he negotiated on my behalf. Part of the arrangement was for me to serve as his Vice-Chair for Faculty Appointments for a year upon my return. This may not sound like much of a prize to many of you who have done that kind of administrative job recently. But, in fact, Sho did himself much of the work himself which other chairs delegated to their vice-chairs, so I was very lucky. I’m very glad that things worked out as they did; among other things, it gave Margo and me many opportunities to enjoy the company of Sho and his wife, whom we always knew by her very appropriate English name of Grace. Sho has left a most impressive mathematical legacy in the form of a roster of 35 Ph.D. students, a long list of contributions to differential geometry, and many influential monographs. Perhaps the most well-known mathematical object bearing his name is the “Kobayashi pseudometric,” which he introduced in 1967. Despite a name which makes it sound like something fake, this is a real measure of distance which quickly became in Sho’s hands, and remains throughout the mathematical world, an essential tool for the study of mappings between and within complex manifolds. Sho’s work remained concentrated in the area of complex geometry, where he made a string of fundamental contributions throughout a career of over fifty years, but he worked in other areas of differential geometry as well. One of my own papers was a variation on a theme he created in a paper on positively curved manifolds. Sho was a master of mathematical communication. He even wrote a paper called “How to write a mathematical paper (in English).” (It was written in Japanese.) More important, his books, especially the two-volume “Foundations of Differential Geometry” with Katsumi Nomizu, have taught differential geometry and complex geometry to generations of students and other researchers. Sho was my personal agent for “opening Japan to the West.” Through his collaborator Takushiro Ochiai, I was invited to visit the University of Tokyo in the Spring of 1987, and Japan has become for me and Margo one of our two favorite destinations (along with France, where Sho himself made his first foreign mathematical visit). 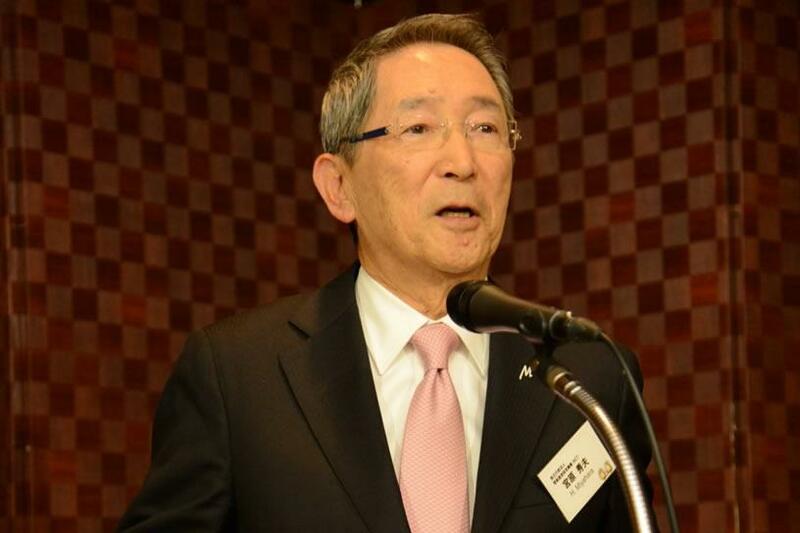 We have gone back many many times and even, a couple of times, benefited from the collection of equipment which he and Grace accumulated for the guest apartments of Keio University. We share the grief of the Kobayashi family, especially Grace, Mei, and Sumi, whom we have long known, as well as other members whom we met just today. We are glad that Sho’s passing was a peaceful one of the kind we all hope for, after a long and fulfilling life, but we will also miss very much his generous friendship, his sense of humor, and the wonderful smile to which Hisashi referred earlier this morning. Fortunately, Sho lives on in the form of his magnificent mathematical legacy and our memories of a wonderful man. It is a sad but very great honor to attempt to express our Department’s enormous admiration of and appreciation for Shoshichi Kobayashi, a task which I am finding as momentous as any I have yet faced. Kobayashi was a major figure in the history of mathematics and of our department: a stellar colleague and mathematician and a heroic chairman. He had a brilliant career, having been appointed Assistant Professor in 1962 and rising rapidly to the rank of Full Professor by 1966. He was also a very kind man, with a quiet strength and a disarming smile whose company was simultaneously comforting and awe-inspiring. Of course I had heard of him long before I came to Berkeley, and when I arrived I was thrilled to meet him and attend some of his seminars. Sho was chairman of the department from 1978 to 1981, and was very kind with me and others. This was also at the time of the famous “space wars,” when the central campus administration was attempting, by means of obscurantist proclamations, formulas, and calculations, to take a large amount of space away from the math department. Calvin Moore, in his book on the history of our department, says “…through subtle and clever diplomacy, Sho succeeded in holding the loss to about ten percent of the total space….a victory.” I remember it somewhat differently: each time our department received a memo from the administration, Sho would post it in public on the bulletin board, along with a polite but thoroughly devastating rebuttal. This made for enormously amusing reading for members of the department, but was not so amusing for the administration. Sho’s meticulous work revealed to me then the difficulty and complexity of the role of chairman. I deeply wish he were still here to help me with his profound and kind wisdom. When I became chair, I asked him for general advice, based on his time as chair. He warned me not to try to do big things to make a name for myself. If I can do half what he did for our department, I will be very proud. Somehow, simply and naturally, he was my advisor and mentor. If there exists anything called native wisdom or inborn maturity, he was the one who had it. His success as a mathematician and his precious friendship to me and to my wife appeared all so naturally, just as matter-of-factly as if we had a big brother who had been looking after us all the way. Shoshichi Kobayashi, 80, Emeritus Professor of Mathematics at the University of California at Berkeley, died peacefully in his sleep on August 29, 2012. He was on the faculty at Berkeley for 50 years, and has authored over 15 books in the area of differential geometry and the history of mathematics. Shoshichi studied at the University of Tokyo, receiving his B.S. degree in 1953. He spend one year of graduate study in Paris and Strasbourg (1953-54), and completed his Ph.D. at the University of Washington, Seattle in 1956. He was appointed Member of the Institute for Advanced Study at Princeton (1956-58), Postdoctoral Research Associate at MIT (1958-60), and Assistant Professor at the University of British Columbia (1960-62). 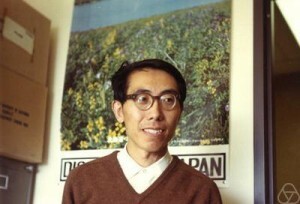 In 1962 he joined the faculty at Berkeley and became Full Professor in 1966. 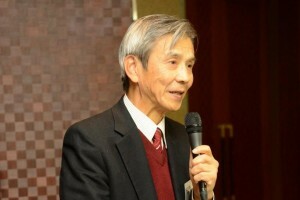 He was a visiting professor at numerous departments of mathematics around the world, including the University of Tokyo, the University of Mainz, the University of Bonn, MIT and the University of Maryland. 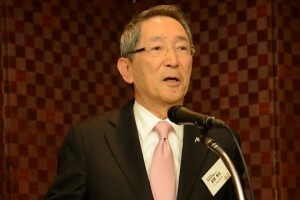 Most recently he had been visiting Keio University in Tokyo. He was a Sloan Fellow (1964-66), a Guggenheim Fellow (1977-78) and Chairman of his Department (1978-81). Shoshichi Kobayashi was one of the most contributors to the field of differential geometry in the last half of the twentieth century. His early work, beginning in 1954, concerned the theory of connections, a notion basic to all aspects of differential geometry and its applications. Prof. Kobayashi’s early work was essentially in clarifying and extending many of Élie Cartan‘s ideas, particularly those involving projective and conformal geometry, and making them available to modern differential geometers. A second major interest of his was the relation of curvature to topology, in particular on Kähler manifolds. Throughout his career, Prof. Kobayashi continued to focus his attention on Kähler and more general complex manifolds. One of his most enduring contributions was the introduction in 1967 of what soon became known as the “Kobayashi pseudodistance,” along with the related notion of “Kobayashi hyperbolicity.” Since that time. These notions have become indispensable tools for the study of mappings of complex manifolds. 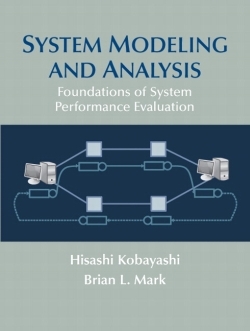 Other areas in which Kobayashi made fundamental advances, into the twenty-first century, include the theory of complex vector bundles, intrinsic distances in affine and projective differential geometry, and the study of the symmetries of geometric structures using filtered Lie algebras. Several of Shoshichi Kobayashi’s books are standard references in differential and complex geometry, among them his two-volume treatise with Katsumi Nomizu entitled “Foundations of Differential Geometry.” Generations of students and other scholars have learned the essentials of the subject from his books. The following is a translation by Prof. Toshiki Mabuchi (Osaka University) of his 1992 description of Shoshichi Kobayashi’ work. His books “Foundations of Differential Geometry, Volumes I & II” coauthored by K. Nomizu are very popular not only among mathematicians but also among physicists. His book on hyperbolicity and transformation groups also influenced many mathematicians. He published more than one hundred papers, which have received an exceptionally large number of citations. The study of Hermitian-Einstein holomorphic vector bundles and Kobayashi-Hitchin correspondence. and existence of Kähler-Einstein metrics is still a central problem in complex geometry. 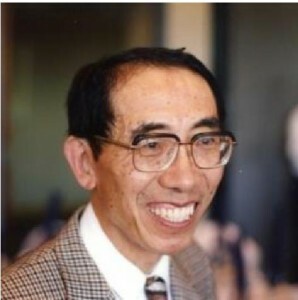 Kindly donate to The Shoshichi Kobayashi Memorial Fund which has been established to support foreign graduate students in the Mathematics Department at the University of California, Berkeley. Click on “Make a gift to Mathematics online” and fill out the required sections on the Give to Cal Online Giving Form. Under “Gift Instructions and Recognitions,” check the box for memorial gift and insert the name Shoshichi Kobayashi. Under “Special Instructions,” please note that this gift is intended forThe Shoshichi Kobayashi Fund. Matching gift from the Chancellor: Gifts from current UC Berkeley faculty, staff and students, retired UC Berkeley faculty and staff, or surviving spouses of active or retired UC Berkeley faculty and staff will be matched under the Chancellor’s Challenge Program. Tax deductibility: Donations are fully deductible from your Federal tax obligations.